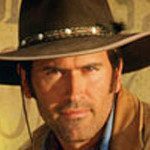 As almost a definition of camp, The Adventures of Brisco County Jr. was a sci-fi western series featuring Bruce Campbell as the titular character. As a lawyer-turned-bounty hunter, Brisco is tasked with tracking down John Bly and his gang. On the way, science fiction, steam punk, and humor jumps out around every corner.